The Kahala Hotel & Resort is one of the most magnificent properties on the south shore of Oahu. It’s an upscale manmade oasis that allows guests to escape the bustle of Waikiki 15-minutes west, while remaining close enough to the conveniences should you be able to bring yourself to leave the comforts of the luxury resort community. But before your laid back adventure begins, you have to find your way to Kahala from Honolulu airport. Below is how to do so, with additional things to consider. You may have heard that the resort offers a free shuttle service, and it does, but this is for transportation from the resort to Waikiki, Ala Moana Shopping Center, Kahala Mall, Iolani Palace and Bishop Museum. When it comes to transportation from Honolulu airport to the property, there is a per person charge. Once your party exceeds two individuals, the total cost of the resort provided shuttle service gets a bit expensive. Plus, you may be sharing the shuttle with other guests/strangers. It makes more sense to book a private shuttle that charges a single flat rate for up to a party of four (more available upon request) for only $40. That’s right, you and your party (and luggage load) can get directly from HNL baggage claim to the resort for just $40 dollars. Given the cost of a night at the Kahala Hotel, that kind of cost savings means a lot, even for those with deep pockets. Book your private shuttle to Kahala Resort. Just a $40 flat rate! What about the other options? Given that the stretch from the airport to Kahala involves highway exits leading to the center of Honolulu and Waikiki Beach, you can get stuck in traffic on the I-H-1 E before you take exit 26B to merge onto Waialae Avenue towards the Waialae-Kahala Business District. This makes renting a car less than appealing. There is a Hertz located at the resort, so save your rental aspirations for after you’ve arrived at the property. What about a taxi? With an average HNL to Kahala Resort travel time running between 30-40 minutes, taxi fare will at the very least start at $45. That’s more than our $40 flat rate service. Plus, do you really want to show up to one of the island’s most upscale resorts in a city taxi? Certainly not. A new (and private) Sienna sounds a lot better. What about ride share? Again, with a travel time of 30-40 minutes you will have a hard time beating a $40 flat rate, especially of you have a party of four and/or lots of luggage, the latter of which may require an UberXL which can inflate the cost considerably. In addition, a typical Lyft or UberX is a gamble when it comes to vehicle condition, and you don’t want to roll up to a Four Diamond Award winning property in Arthur’s old Camry. Use our professional (with commercial license) direct shuttle service instead of subjecting yourself to all that an happen when using a ride share from HNL to your resort. What’s there to do? 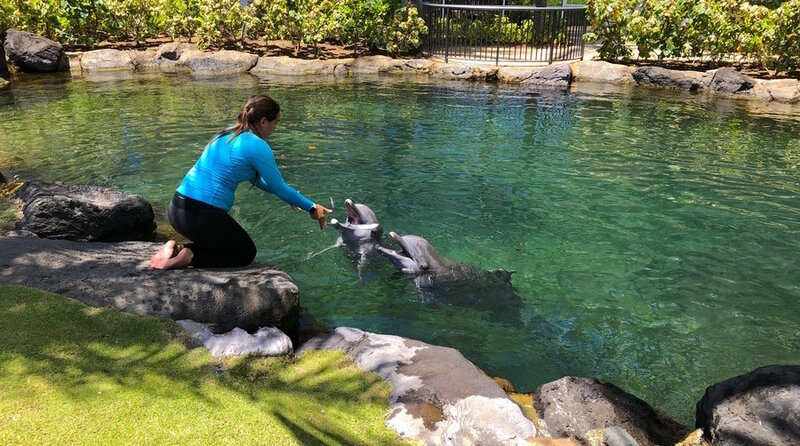 A lot, but the favorite activity for most is made evident from the moment you walk outdoors, where you’ll find Dolphin Quest Oahu, right smack dab in the middle of the resort. It’s quite a sight to see the dolphins which have been born and raised (six generations deep) at Kahala Hotel & Resort. Even when not a part of a non-invasive (no riding on the dolphins) guest experience, the beautiful aquatic mammals frolic in their expansive playground, playfully swimming, jumping, and toying around with basketballs and bumper floats to the delight of all on site. All you need is your smartphone camera and you’ll manage to capture plenty of footage before you get settled into your accommodations. There is also a sea turtle and and tropical fish pond, a guest swimming pool and lounge area, indoor/outdoor dining facilities, a gift shop, and more. And of course, there is the impeccably landscaped property to explore along with the beachfront where you can work on your tan before check-in time arrives. Swimming pool and beach rentals are available from 8 AM. Arriving at HNL early? 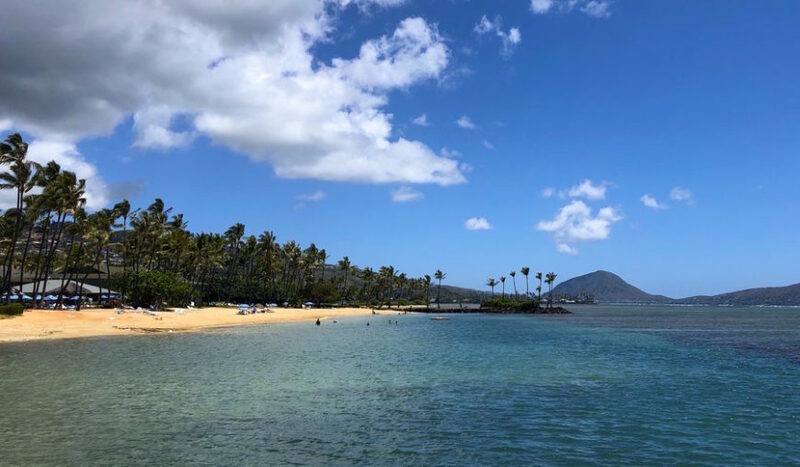 Book your private shuttle to Kahala Resort. Just $40! Have any additional questions? Contact us directly by calling toll-free to 1-800-929-1219, anytime. © Honolulu Airport Transfer. All rights reserved.